What Is A Bazoodie Chat? *This is actually the second and final part of a two-part post which began with: "Gmail & Inbox: Comparing The Two Email Apps - Part One: Gmail". So if you wish to read the whole article, please start from there. I noted in the first posting that Inbox was essentially a new app from Google which takes a different view of how email can be made more useful and the least overwhelming. Inbox is not simply another email app which does what Gmail or the multitude of email apps out there do with a bit of a difference. Inbox requires a different "head-space" and a totally different view of how to handle email and what the ultimate purpose of email is and what it should be. The best way to describe the difference, at least in my opinion, is that Gmail app is a linear process of thought. One email after another, perhaps divided into labels and categories. Inbox is what I what I would call OOT = "Object Oriented Thought". It turns your email into objects which can be acted upon in specific manners and in a way and time you chose. Looking at email in such a new way, can only be accomplished by a company which has experience with hundreds of millions of users and their suggestions/complaints about improving the original Gmail product. I can only speculate as to why Google decided on two distinct apps, rather than combing them into one app, and allowing the user to chose their own interface. My assumption here is that the philosophies of the two systems are so different in the way the consumer views their own email, that two distinct apps are required, allowing the end-user to chose which best suits their purpose. As I mentioned in the first part, I ran both Gmail and Inbox side by side for 10 days now. 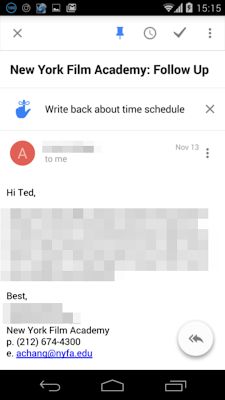 And to repeat since there is an actual "Inbox" in the Google App Inbox, when I refer to the actual [Inbox], it will be with those brackets around the word. This is to avoid any mistakes or confusion. Let us begin by saying the foundations of Inbox seem to be in the evolution of Gmail. 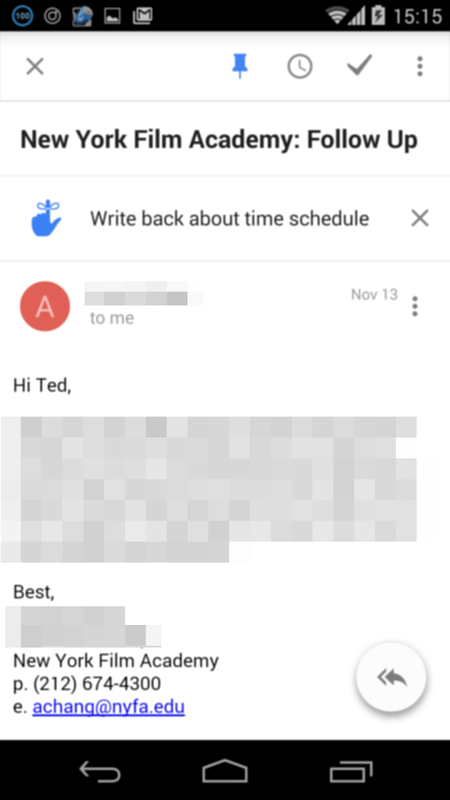 A while back, Google attempted to make email more manageable by introducing the Priority Inbox, along with the Social, Forum etc. categories. This was in addition to any label system one might have created to keep emails in their proper place. Labels and filters are tremendously useful, provided one actually set them up and use the label system. However, Priority Inbox Email, was not only confusing to most people, it was really not used. I mean, [Inbox] email is [inbox] email, right? So Priority email for many, just became a synonym for their [Inbox]. All mail kept on being dumped there. Other email which Google could figure out through its algorithms, ended up in the Social or Forums or the few other categories within Gmail. Then one had to go from one to the other, using the menu, opening the screen and wading through the email in each category. If you are a celebrity, or a business person receiving literally thousands of emails a day and require a staff of assistants to wade through the stuff, then Inbox is definitely for you. Yet since most of us are not wading through thousands of emails a day, but rather hundreds, then the question arises if we should even think about approaching email in a different manner. I think if you are dealing with anything over 40-50 emails a day, you owe it to yourself to give Inbox a try and attempt to see email sent to you in a whole new fashion and order. You may be surprised at how swiftly you can actually pinpoint emails that require immediate attention and those that can wait a bit, and those that need to be scheduled. Actually also those which can be dumped and trashed. Though all the above can be done with any email system, it is the "head-space" of Inbox which is fairly new. And it is that specific area of the Inbox which I intend to explore in this article and how Inbox implements it, to make your Email life easier to control. The first essential thing to understand is that Inbox will attempt to categorize your emails for you when they hit your email box. Categorization is critical here, as Inbox assumes you will want to sift through emails based upon the original category assigned to it. Without getting too complicated here with charts and methodology of thought, let us go straight to an example. 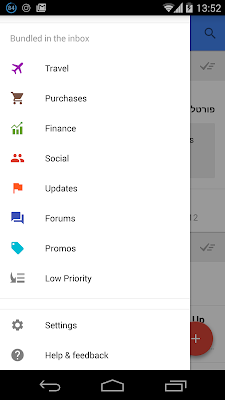 When you go into inbox you will find most, but not all of your email placed into various categories or if you wish Generic Labels which Inbox has set up beforehand. The image above reveals some of the changes brought to Inbox. If email is categorized you will see the Category and the number of emails within that category that are awaiting your attention. In the image above you can see that my updates folder has 1 new item but 14 others (light print) which I have not yet attended to. The Social category contains 12 emails which require my attention. You can also see that Inbox cleverly combines emails that require attention on a daily basis. 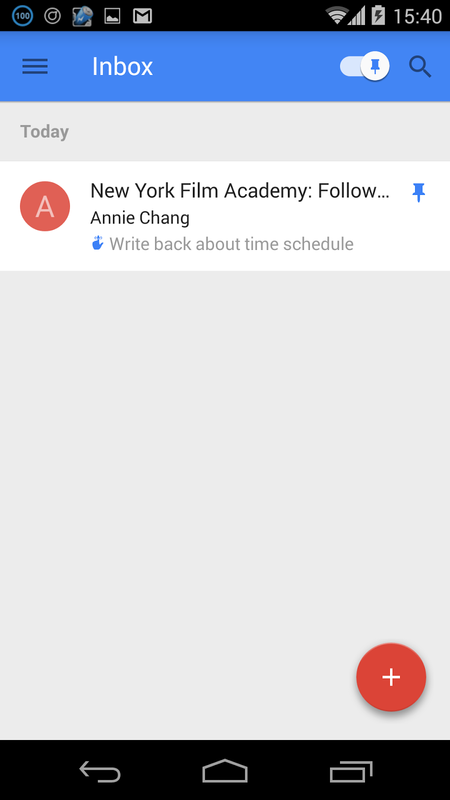 Gmail did not know how to categorize or Label an email from the New York Film Academy, yet it is important to me. So it is listed as a unique entity, not part of some Social, Update, Travel etc. category. Kind of stands out actually, and I personally know that in this specific case it is one email I do want to answer. (It is also the email I will use to show how Inbox works). 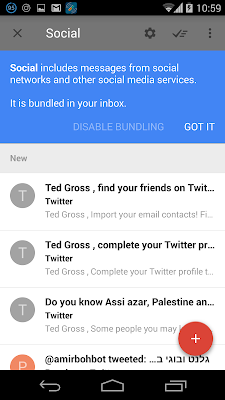 Before going further we must also talk about what inbox calls "Bundling". Without bundling a lot of Inbox features would be just copying those of Gmail. With Bundling though the whole process and method of dealing with email becomes a bit different. As can be seen from the above screenshot, Inbox comes with bundling enabled for most of the categories. But what is bundling? When you bundle messages all messages that are associated with that specific topic are as you can tell "bundled" together. 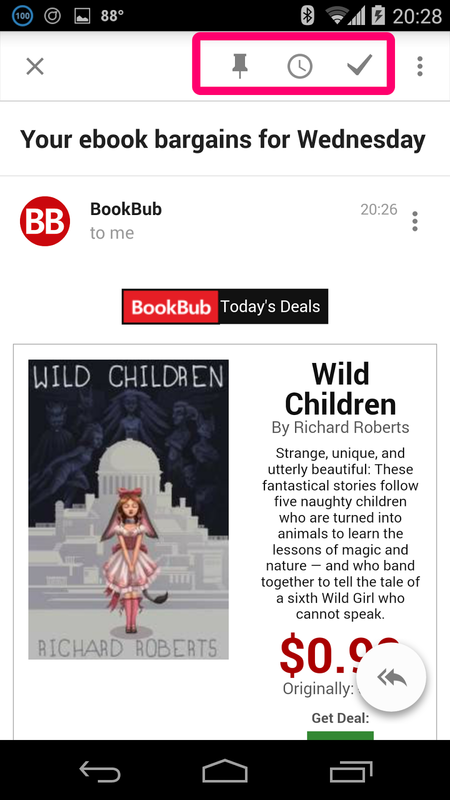 Therefore in your list of messages appearing in your [Inbox], you will not see an entry for each email but rather a single entry for the bundled category, such as what we saw in the first screenshot. All "Social" category messages are bundled together. All Updates are together etc. & etc. 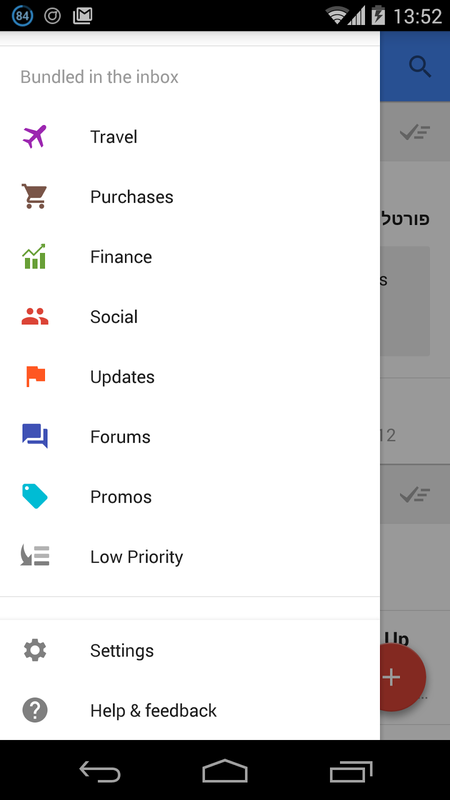 You can turn off bundling of any category you wish at any time. Your labels are not bundles. Do not confuse the two. Labels are your own internal way of organizing the emails you wish to keep. Bundles are de-facto organization of incoming emails. Think of Bundles as having Google apply its already vast information base to the address of your incoming email, and then say if the email is from "Facebook" it knows to put it in the Social Bundle. The effect of bundling, which takes time to get totally right, is that you will know at any moment what demands immediate attention, what can wait a bit and what can be deferred for a day or so. For instance you may want to see anything that came into Updates immediately. Or if you just purchased a ticket on line you may want to see what came in to Travel immediately. Bundling appears together in the main [Inbox] and tapping on the category will then show you each individual email within that category. Then you deal with them on a one by one basis or chose to batch move, label or delete them. Before you begin to think that this is the point where Inbox becomes Gmail, when dealing with singular emails, think again. There are some very important additions which will be described below. The one downside of bundling, which you may experience once in a while, is that sometimes normal immediate reflex to send something to trash. If you check off Social in your [Inbox] when all emails marked as social are bundled, and then tap to "trash", ALL the emails in Social awaiting your viewing will be deleted.So be very careful with using any of the options on a bundled category. As you can see from the above screenshot Inbox has quite a few bundles which you can either use or turn off. The one pet peeve I have is the Low Priority one. 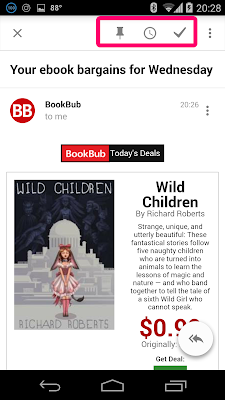 Whereas you can bundle this category, email which for whatever reason, the engine of Gmail decides is not important and does not belong in any of the bundles, goes there. (The All Mail category of Gmail). So Low Priority sometimes contains really important email. This is actually the place where, if you wish Inbox to really work for you, then for the first few weeks you will have to tell Inbox how to sort the email coming into you Low Priority bundle. It should be obvious as well that Inbox does not get it all right all the time. You are going to have to teach Inbox along the way about specific email addresses and where you want them to fall, and into which bundle. But overall, for those of you familiar with it, bundling is the next step after Gmail introduced Categories such as Social etc. into its normal engine. And if it were just bundling that was different than Inbox would just be an interesting footnote. Luckily, the Inbox App contains a great deal more. What makes Inbox unique, is not only its bundling possibilities. Bundling is actually incredibly useful when you are dealing with over 50-100 emails a day. It is kind of a first sifting which Google does for you before you even look at the email. But the application developers did not stop there as logically Email usually requires a response or action on your part. This is where Inbox truly shines and indeed even if you only get 5 important emails a day, the added functionality of Inbox will benefit you as well. This functionality comes in the form of 3 interesting icons (I boxed them in red in the above screenshot), and two swipe gestures. So let us dig into each of them. In order to understand these new icons you should begin to think of email not only as a purveyor of a message but as one of the many reasons you make changes to your calendar. After all, an email can be an invitation to an event. Or a reminder of an upcoming conference. Or something that does not need your immediate attention today but will certainly need it 5 days from now. So let us say the email from the NY Film Academy is important to me. BUT I really do not want to deal with it until a later time today, or @ some future date or when I arrive at my weekend home. So I tap on the clock, and get a snooze screen. 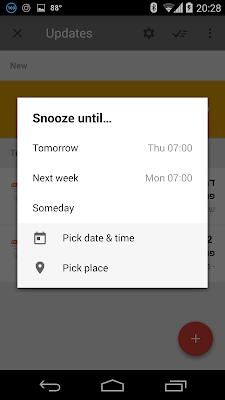 My choices are date & time or location. This will put the specific email into "snooze" mode until that moment in time when I have determined I want to be reminded that I need to deal with it. This is an incredibly useful especially since I really need to answer them, but I also want to wait until Sunday to do so, as in this instance I want to give myself time to formulate the correct answer. Since I also sometimes forget things, and by nature procrastinate, this is a perfect tool for me. 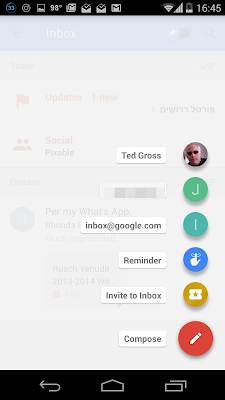 By the way you can also immediatly snooze an email without even opening it up by swiping to your left. (Swiping right will archive the email.) 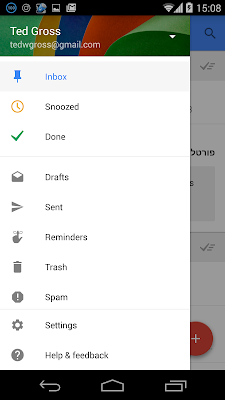 Once you snooze an email it goes into the snoozed category so you can also view the emails you snoozed any time you wish or need to, and of course change their parameters,(see image below). Okay now I have essentially turned my email via Inbox into a calendar system. Now I want to make my email work for me in an entirely different manner by not allowing me to forget information. Now when I go back to the display of emails I will immediately see which is snoozed and/or pinned. So if something is pinned the list will display both a pin and a hand with the email. 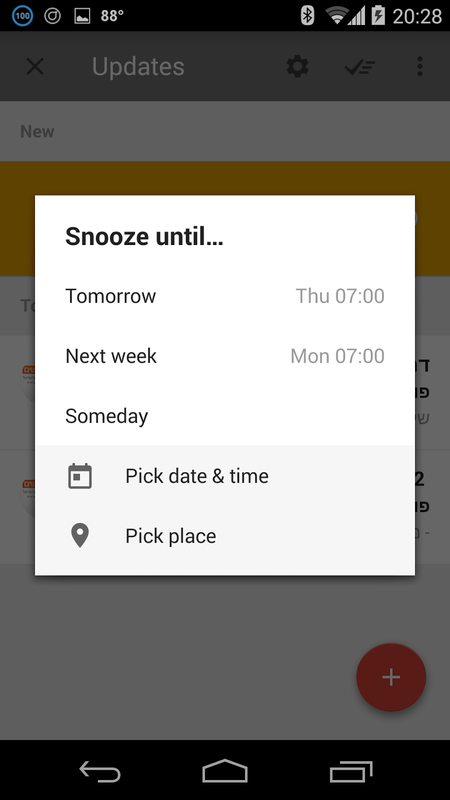 It is also snoozed then it will be in the snooze category. In effect Inbox had turned email into a fairly efficient calendar and very specific and directed To-Do List per email. Couple this with Bundling and you really do have a totally new system. The check on top, the last strange icon marks something as done. This can be done from the individual email or from the main menu.Want to see everything "pinned" from the main menu? Just click the blue pin and only those pinned emails will show up. These may be with reminders or not, but they will remind you that for whatever reason you used the pin to mark them as important. We have now covered some of the more major aspects of Inbox. Time Scheduling per email based on time or location. Reminders per email - a virtual specific To-Do List for any email within the same system! Swiping to make archiving and scheduling easy. Finally where the Gmail app has a pencil, the Inbox app has a plus sign, clearly visible in almost all screenshots above. When you tap on the round plus sign, you are greeted with a Material Design Menu. The first three in this menu are actually the last emails I sent. Inbox assumes you want to compose again to the same people. Then of course there is the reminder. Then if you have any invitations left you can invite others to inbox. And finally the compose button to bring you to a new email screen for you to compose your next email. Either way this shows incredible flexibility and planning out in the app. There are still a few other things we should mention about Inbox. It does not do anything to your Gmail App. If you delete/trash an email in Inbox it will show the same status in Gmail and obviously in reverse. You can run both apps at the same time. 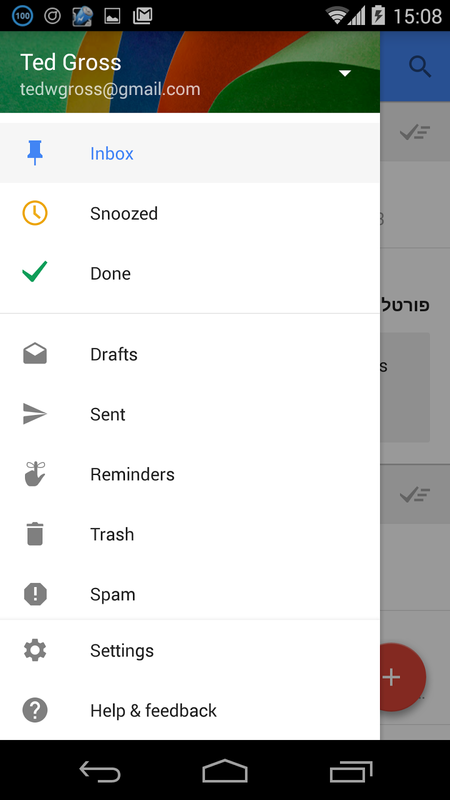 If you wish to turn off notification in the Gmail App you can do so in the app settings for each account in Inbox, or you can do so in the Gmail app under your account. Inbox simply does it for you so you do not have to exit the app, then go to Gmail then look up the account and turn off notifications. The choice is up to you and you can turn them back on again, But be aware. Having notifications for Gmail and Inbox turned on will cause your phone to push notify you twice for each incoming message. One from Gmail and one from Inbox. The Low Priority bundle needs to be carefully monitored at the beginning. If it is ignored you will find yourself possibly missing important emails. 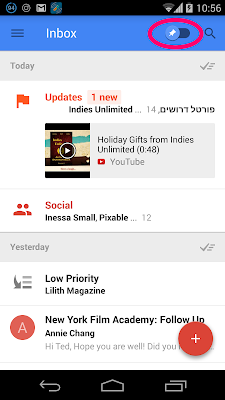 Is Inbox for you? Again I must repeat. It depends on your "head-space". It depends what you want out of email, and how important it is to your personal or business life. It also depends if you are willing to leave the linear thought process of email behind and think more in terms of an OOP structure. It is OOT = Object Oriented Thought expressed within an email app. If you can get used to it, especially if you find yourself drowning in emails, then Inbox is worth a shot. It is a five-star app, which is well thought out. It still needs to mature and still requires such possibilities that we all have been spoiled by, such as default signatures and the like, but I have no doubt the developers will be putting that in. I love Gmail. I really took to Inbox. I like the object oriented thought. 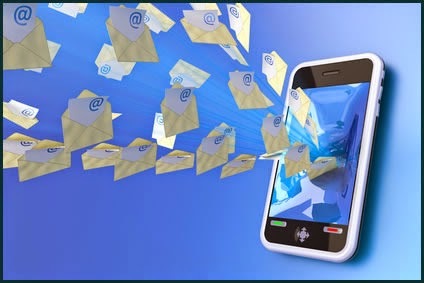 I also think email must slowly evolve into a tool not only to relay a message, but to give us the ability to take notes, decide priority, and set up our schedule all from one app. If all this means something to you, get an invite from a friend or Google itself and start using Inbox.You will not regret it. *Ted Gross is an award winning Blogger and Author, and has spent over thirty years in Technology as a CTO. The Bazoodies blog is devoted to reviews and the social impact of many of the new technologies and apps emerging today. Comments are always welcome. What Exactly Is A Bazoodie Chat & Bazoodies?